I will preface this by saying I am currently an inactive Freemason. Below you will find a list of Masonic resources that I recommend. If you know of something that I don't have listed here, let me know and I'll check it out and if I like it, I'll add it! Whence Came You? podcast - an excellent resource for all Masons (and those interested in Freemasonry). The Master's Jewel - absolutely AWESOME Masonic jewellery. The Masonic Grand Lodge of Indiana - the Grand Lodge of my home state. Mackey's Encyclopedia - a great digital encyclopedia of Freemasonry. The Midnight Freemasons - a great Masonic blog with various contributors, generally updated Mondays, Wednesdays and Fridays. Not a Mason and you'd like to know more about Freemasonry? 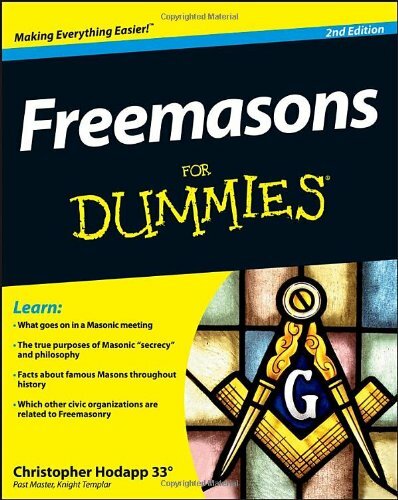 I highly recommend you check out Brother Christopher Hodapp's book Freemasons For Dummies, it's well written and will give you the basics.